I was in Milwaukee recently working with a group of managers to develop assertive communication skills. We started by discussing the role personality plays into communication styles and everyone took an assessment. A personality assessment provides critical insight into your natural tendencies when dealing with conflict, which is how many people view giving feedback. DiSC® is a four-quadrant model that at its simplest identifies your personality by first separating your tendencies into fast-paced or thoughtful, then people-focused or task-focused. Learn more about DiSC® here. I asked the group what they thought about sharing their feelings when giving feedback in the workplace. Half the group thought it was fine and the other half said nope, stick to facts. Interestingly, or maybe obviously, the half that said it was appropriate to share their feelings when giving feedback were relationship-focused people. The half who said stick to the facts were the task-focused people. For the record, I’m not a fan of sharing your feelings when giving feedback. Here’s why… I don’t think it’s possible to tell someone how you feel about what they did without placing blame on them. Blaming is a form of aggressive, not assertive, communication. Blaming is a sure-fire way to create a defensive reaction in the other person. A person who is defensive is not going to be open to anything else you have to say. If you want to get results and give feedback that gets results then be prepared. Preparation is the key to assertive communication. Preparation includes getting the facts and scripting the conversation so you can get your thoughts in order and on to paper. Once you have them down you can examine your words and remove any that can cause the other person to shut down. Words that are demanding, blaming, or accusatory are not helpful. Assertive communication gets to the point yet is polite. Assertive communication provides clarity around who, what, why, where, when, and how. It focuses on the issue, not on the person. In the workplace especially, it’s important to keep feedback focused on job expectations. At least if you want to stay out of the drama vortex. The drama vortex is when the person on the other side of the conversation tries to derail, deflect, and sidetrack the issue at hand. Feelings are subjective and personal and can easily set up a situation where the focus gets away from real issue which is getting the work done. These guidelines work really well in your personal life too. Here’s a simple real-life example: a father and his young-adult son were golfing and the father naturally had an arsenal of advice for the young man. The young man politely, yet assertively, said to the father ‘I don’t do well with advice.’ End of story. No blame, no hurt feelings and everyone had a pleasant round. That was assertive communication. My general rule of thumb is this: If what you’re doing is working for you then keep doing it. If it’s not, then be willing to try something else. How do you know when your method isn’t working? When it’s not a win/win and you aren’t getting the results you want. Just because someone does what you tell them to do doesn’t mean you were effective. 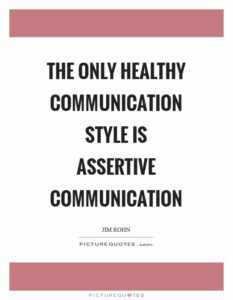 Use assertive communication and people will want to do what you want them to do and that will produce the best results! Liz Uram works with leaders to get better results through clear communication. Request a free copy of the C.O.R.E. Feedback Formula to improve your assertive communication skills.